Modern technology brings many wonderful additions to the world of construction, but there are times when the traditional choice is still the best. One new option that contractors are considering is Durfalex window sills. While this PVC-type material may offer some benefits over wood, it still cannot compare with the natural beauty or incredible durability of natural marble window sills. Duraflex window sills have been used in colleges and schools around the country because they’re durable and affordable. However, marble graces high-end homes, hotels, and resorts because it can last a lifetime and is one of the most beautiful materials available. Duraflex is made from a PVC-type material that’s non-porous and pure white in color. While it may be appropriate for use in commercial settings, it doesn’t have the amazing colors and style available in natural stone like marble, granite, and travertine. One of the biggest benefits of Duraflex is that it can be relatively easy to clean in these sorts of settings. Imagine a classroom full of younger students all armed with juice boxes and ready to do some damage. If they spill some sticky liquid on the window sills, then a teacher can easily wipe it up later without leaving any residue. What many people don’t realize, however, is that marble can be just as easy to clean in a residential setting. In fact, people don’t use their window sills in the same way at home that students might in a school, which leads to a very different situation anyway. In fact, the marble will more than likely hold up the best over time because Duraflex will ultimately deteriorate. Any of these materials are very durable, but only marble can last for a lifetime. Wood is by far the most labor-intensive option. Property owners will need to monitor it for damage and have it refinished over the years. Any type of plastic-based window sill will also gradually show signs of wear and use, including scratches that may capture dirt and scuff marks. Marble, however, is the most durable option. While any natural stone can still scratch under the right circumstances, the color goes all the way through the stone. Scratches aren’t prone to showing, and they can be buffed out if there is a mishap. Unlike a plastic material that will eventually show strain from sun damage and wood that becomes more damaged with every passing year, natural stone sills can last for a lifetime. This makes them the most cost-effective choice available. Close your eyes for a moment and think of those ancient Greek and Roman monuments that photographers love to put in travel guides and social studies textbooks. You’ve seen quite a few of these, more than likely, and they certainly looked rather attractive for buildings that were nearly 2,000 years old. The reason is that they were built of marble in a time before the dawn of synthetic materials. What you might not realize is that many of the ancient architects who designed these structures made extensive use of wood. The planks they used have simply rotted away, providing a pretty graphic illustration of how long marble can hold its luster! You might think that wood and Duraflex are cheaper than natural stone, but you’d be surprised to discover that stone outperforms the other materials even in initial price. When you buy wood, you need to allow for the extra expense of sanding and painting the surface. As a homeowner, you’ll want to consider the ongoing maintenance requirements in both supplies and time. 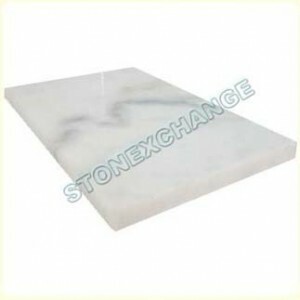 At prices as low as $3.95 a square foot, the marble will actually cost less than many man-made window sills. This means that you can save on the front end even while promising your clients a durable and attractive product that they’re sure to love. Wood can be painted to match any beautiful color, or it can be stained a natural color. Duraflex comes in one shade of brilliant white. While this may be appropriate for some industrial areas, it won’t work in all settings. Only natural stone gives you the dimension and color that discerning customers are searching for. Only with marble can you find wonderful shades of tan, white, cream and even red. Marvelous granite sills are a great addition to modern homes, and travertine brings warmth and class to any setting. While pure white may be called for in some situations, it’s important to note that the color of Duraflex cannot be changed as it can with wood, and it doesn’t have the versatility and beauty of natural stone. That being said, some interior designers really do like the stark white look of Duraflex. They don’t have to sacrifice the other attractive features that stone offers if they feel very strongly about this. Pure White Thasoz is an engineered stone that feels a little more like the stone they’re used to still have that futuristic gleam. Unlike Duraflex, it’s made from a blend of glass and resin that should hold up relatively well to the test of time. One great benefit that’s shared among the materials is the ability to install a solid piece in the window. Minimizing seams helps to speed up the installation while creating a more waterproof surface and attractive finish. There’s no reason to piece different pieces together with natural marble sills because they can be custom ordered in most dimensions. When you’re working on a project with multiple windows, you can easily order the sills in bulk for fast installation and a consistent look throughout the building. You’ll also save when ordering in bulk through companies like StonExchange, and that helps you to put further cost control measures in place. Wood has a dull finish that can only be changed with paint or stain. PVC offers a high-gloss finish that will last for years to come. However, marble provides you with a few options. Depending on how the stone is finished, you can achieve anything from a rough, tumbled finish to a glossy surface that shines in the sunlight. Unlike plastics or paint, the finish on marble will never fade, and you can easily restore and bring out the shine at any time by simply cleaning the marble and putting a protective sealant on it. One great benefit of marble sills that should not be overlooked is the ability to match it to other materials in the home. A room with a beautiful marble floor will look out of balance if the window sills are a brilliant white PVC material. Marble is a stunning building material that’s been used throughout the centuries in part because it matches other materials beautifully. It can be used in a room with any type of flooring from hardwood to plush carpet. It matches most other colors because it has a range of colors mixed into the stone by nature. While brilliant white might look out of place, natural marble will always look right at home. Gorgeous dark black granite, too, will match almost any look and you’ll never have to worry about it seeming dated or obsolete at some point in the future. Engineers have been using it for centuries, and they’ll continue to do so for hundreds of years to come. You’ll be able to stay in style no matter what kind of materials you elect to mix together! When you work with an experienced company, you can expect to receive great customer service. The friendly and professional staff at STONEXCHANGE believes in providing customers with excellent service and great prices. We pay close attention to detail in order to ensure that orders are filled properly and you have the right stone product for your needs. When you’re ready to invest in window sills, look beyond the modern materials to consider something more traditional. Marble has been used in windows and other construction areas for centuries because it’s durable, visually appealing and cost-effective. It can withstand temperature changes, moisture, and regular use. It won’t fall victim to mold, and you won’t have to worry about the sun degrading the material and causing it to crack. Contact us today to review our selection of marble window sills and see if this is the right choice for your next project.